Cambodia's decision to walk out on a contract with a U.S. military unit has set-off alarm bells within the diplomatic community and raised concerns that Prime Minister Hun Sen is prepared to sacrifice millions of dollars worth of humanitarian work to appease regional powers like Russia and China. Diplomats and political analysts said they were stunned by a government notification ending work on schools and hospitals by the U.S. Navy Mobile Construction Battalion, or the Seabees. “Well, I will find it extraordinary that Cambodians would happily cancel these types of projects without something coming in to replace it,” said Billy Chia-Lung Tai, an independent human rights consultant at CL Consulting. “But who's going to be building these projects and where's that money going to come from? Or are these schools and hospitals simply just not going to be built and if that is the case are these projects now going to be picked up as Chinese funded projects,” he said. The Cambodian government has not said why it declined to renew it's Seabee contract, a move described by one diplomat as another “poke in the eye” for the Americans. It's a point of frustration for Washington given the nature of the Seabee work. “Since 2008 the Seabees have carried out $5 million worth of construction projects that benefited tens of thousands of Cambodians across the country,” said Jay Raman, spokesman for the US embassy in Phnom Penh. “They've completed projects such as maternity wards, hospital improvements, water wells, bathroom facilities in public schools and similar projects, working hand in hand with the Royal Cambodian Armed Forces and local communities,” he said. Whether China or Russia will step in to fill the breach remains to be seen, but the apparent use of genuine humanitarian works for political point scoring has left Cambodia's most vulnerable even further exposed. “They were scheduled to build six additional bathroom facilities at schools and two new maternity wards this year and next and they had many other projects coming out for 2018 and 2019, but unfortunately those have now been cancelled,” Raman added. FILE - Philippine President Rodrigo Duterte speaks during a visit in Baguio city, Philippines, March 11, 2017. The cancellation of the agreement means at least 20 planned projects will be scrapped in a move reminiscent of Cold War plays. Carl Thayer, Emeritus Professor at the Australian Defence Force Academy, added Hun Sen might be attempting to re-position Cambodia politically on his belief that the U.S. is on the decline in East Asia while Russia is seeking to raise it's regional profile. 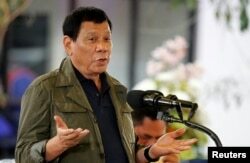 This was helped by a shift towards China by Philippine President Rodrigo Duterte and a lack of clear foreign policy direction from the White House following the recent election of President Donald Trump. Those anti-U.S. actions included a Hun Sen request for forgiveness of a $505 million debt owed to the U.S. for food and agricultural goods. The money was borrowed by the Lon Nol government in the 1970s, during its civil war with the Khmer Rouge. The Russians have also refused to renegotiate a $1.5 billion debt incurred by the Cambodians during the Moscow-backed Vietnamese occupation of the country in the 1980s. However, China did write-off debts incurred in the 1970s by the Khmer Rouge regime about 15 years ago. In January, Phnom Penh suspended joint military exercises with the U.S., citing the June elections as the cause while rejecting suggestions that its decision was related to military and financial ties with China. Beijing held its first joint naval drill with Cambodia last year after it funded lucrative contracts for Chinese-made weapons, jeeps, helicopters, and training. FILE - Russian President Vladimir Putin. 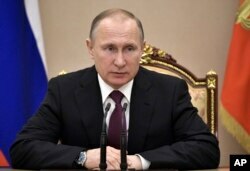 Thayer said it became clear about three to four years ago that Russian President Vladimir Putin was angling towards a re-engagement in the Asia-Pacific. Thayer added the Russian navy had also conducted several exercises with its Chinese counterpart and last year had visited the Philippines after Duterte’s pivot to China. China and Cambodia are also steadily tightening their diplomatic relationship. In the past month, Beijing said it was expected to bestow sister city status on Phnom Penh while a separate agreement was struck with Shaanxi Province to increase trade and tourism. With commune elections due in June and general elections in July next year, the ruling party is increasingly relying on Chinese largesse as its backbone for a booming post-war economy. Two-way trade between Cambodia and China is expected to top $5 billion this year.